French polishing is a wood finishing technique that protects the wood and brings out the natural beauty in the wood. Shellac is applied by hand using a rubbing pad. This process is repeated over and over so that you are left with a rich finish. The wood is left for 24 hours to allow the polish to work into the wood, which results in a perfectly finished surface. Shellac helps protect the wood and extend the life of your wooden furniture. Replace your wooden furniture or get a French polish? In most cases wooden furniture can be very expensive to replace, the most cost-effective way can be to get your wooden furniture French polished as it can be cheaper than buying new furniture. Looking for a French Polishing near you? If you are looking to get your wooden furniture looking like brand new again, look no further than Homeserve Furniture Repairs, the nation's number one furniture repair network. Established in 2004, Homeserve Furniture Repairs achieved rapid growth by delivering a quality furniture repair service that was second to none. Our network of Nationwide Furniture Technicians allows us to provide full coverage of the UK & Ireland to provide you with a quick and convenient service. 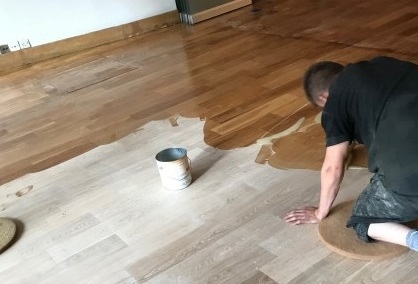 Overtime your floor will become worn and faded, we have a dedicated team of floor specialists that will sand down the floor with our state-of-the-art equipment that have dust extractors which will leave your premises virtually dust free and making the process faster as we minimise the tidy up time. We have wide variety of oils, lacquers, and stains that give you the best option for matching your existing decor which will give you that beautiful and top-quality finish. Grain filling is often used when there is an imperfection in the wood such as chips which can be then sanded and then filled in with a hard wax which will give you that smooth finish to the wood. Our technicians are trained in all aspects of cosmetic and structural defects in wood. Established in 2004, Homeserve Furniture Repairs achieved rapid growth by delivering a quality furniture repair service that was second to none. 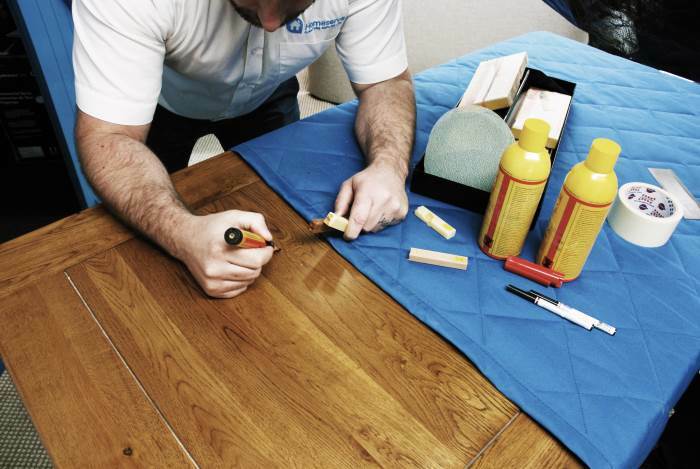 With over 130 technicians nationwide, Homeserve Furniture Repairs is the UK's largest furniture repair company. We also have over 30 call centre staff to ensure that all calls and enquiries are processed with the maximum efficiency. Very nice technician came out to come and look at the chip that is on the top of chest of drawers, He did a wonderful job of our chest of drawers, it's like the damage was never there would recommend. On the day of my appointment I was kept fully up to date on when the technician was arriving at my property. The technician was very friendly and even took his shoes off without being asked, he also resolved the issue with the marks on the table in a very timely manner. The chap that came to repair our Welsh dresser phoned 30 minutes before he arrived, he then rectified the issue and managed to repair the affected area. I was very impressed with the service top class!! Great service. The mark on my oak coffee table has been treated by the technician and looks brand new again. Excellent service. First class communication, and the technician that came out to look at my cabinet door was very professional and efficient in the way he did his job. I don't usually bother giving feedback anywhere, but this was so good, I simply had to. Well done! !